In Hohhot, Inner Mongolia, where I live, the language is not only alive but flourishing. From primary school through university, it is possible for anyone, not just a Mongolian, to study the Mongolian language. Currently three Mongolian-Chinese primary schools exist in Hohhot, as well as several bi-lingual secondary schools. And all the major universities have several double faculties -- where either Chinese or Mongolian is used to teach courses. Additionally all these universities list university level Mongolian language courses for any foreign students who wish major in the Mongolian language. Finally, the Chinese government supports a Mongolian School of the Arts where courses on Mongolian dancing, specialized Mongolian singing techniques and traditional Mongolian instruments are offered. Many of these graduates become professional performers. Some graduates travel internationally and act as representatives of Mongolian-Chinese culture. The Xing'an Road Minority Primary School has been open for six years. The headmaster, Da Lu Du Ren, a jovial Mongolian man, greeted me at the gate and said, "Welcome. 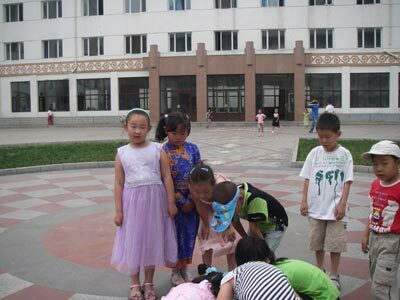 We are the only primary school in Hohhot that offers Mongolian, Chinese and Korean classes. 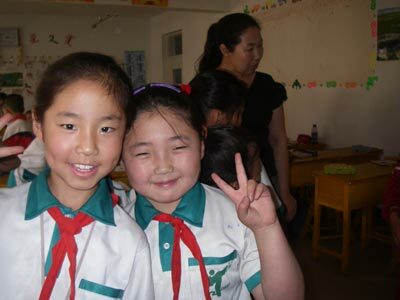 We have 82 staff members, 66 are teachers and many are renowned in Hohhot and Inner Mongolia. We aim to provide an excellent education." As he led me around, he explained that his school provides a full academic curriculum in Mongolian and Chinese for 1,200 students, ranging in age from six to thirteen. The vast majority of the students are locals, from full blood Mongolian families. "Only a few of them, less than twenty, come from mixed marriages," he remarked. "And there are a handful from families that just a little Mongolian blood. But we have one student, a Buryat from the Russian Federation, who has come as far away as St Petersburg to specifically study Mongolian and Chinese. And right now we also have some Korean nationals and some Outer Mongolians." A few minutes later I walked around with a slender woman in her thirties, a science teacher named Mu Lan as my guide. 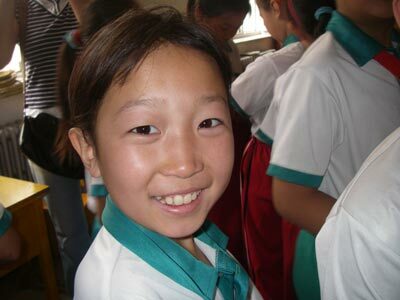 "Our school has a large sports area, we teach Mongolian sports, such as wrestling," she proudly said. "And we feed our children healthy meals, here is the cafeteria." Spacious and clean, filled with rollicking students, the room had a nice feel to it. 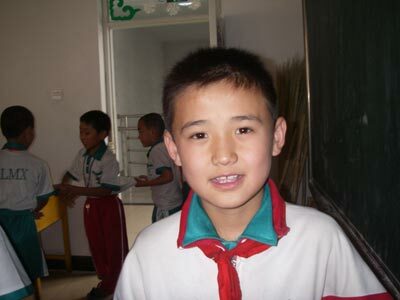 "Over a hundred Outer Mongolian students live here at the school. We provide them with room and board. Three Russian students also attend our school, two from Ulan Ude. They both lives on campus but the boy from St. Petersburg lives nearby with his family. Twelve Korean students board here as well. They are all friendly toward each other." "Why do these foreign students come to your school?" I queried. "Because our educational system is superior to their countries," she replied. "And because their parents may be working here in China, or their parents want their children to learn Chinese but keep their own Mongolian language too. I have my son enrolled here for those reasons." "Do you think the Mongolian language will continue to survive? In my country many minority languages have disappeared," I commented. "Yes, I most definitely think Mongolian language and culture will survive. The Chinese government has passed laws encouraging and supporting minority languages. Two years ago the government made a law protecting the Mongolian language. And the Mongolian people are a proud race. We will uphold our traditions, keep our language, and enjoy our traditional foods. Now, would you like to eat a little Mongolian lunch with me?" Mrs. Mu Lan asked. "The food here is quite good." "With pleasure," I replied, smiling.